Atlanta Falcons offensive lineman Ben Garland joined fellow NFL players Mario Addison, Mark Ingram, Carlos Dunlap, Latavius Murray and former head coach Rex Ryan on the 2018 USO-NFL tour of military bases in Italy and Germany. The two organizations have partnered for more than 50 years in an effort to strengthen service members and their families by connecting them to family, home and country, no matter where they serve. “This tour is one of many ways we work together to salute America’s men and women in uniform by bringing them a taste of home and the thanks of a grateful nation for all they do to protect and defend our freedoms,” USO CEO and President J.D. Crouch II said in a release. Atlanta Falcons offensive lineman Ben Garland turned 30 during the 2018 USO-NFL tour to Germany and Italy. Minnesota Vikings running back Latavius Murray joined four NFL players and former coach Rex Ryan on the 2018 USO-NFL tour. 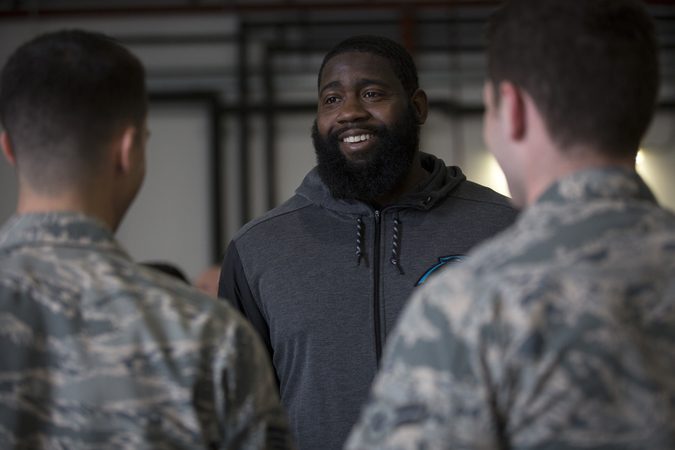 Carolina Panthers defensive end Mario Addison joined four fellow NFL players and former coach Rex Ryan on the 2018 USO-NFL tour. New Orleans Saints running back Mark Ingram, a Heisman Trophy winner, strikes the famous pose while former NFL head coach Rex Ryan looks on. Former NFL head coach Rex Ryan has a laugh during the 2018 USO-NFL tour. New Orleans saints running back Mark Ingram takes a selfie with troops at Aviano Air Base in Italy during the 2018 USO-NFL tour. Carolina Panthers defensive end Mario Addison signs and autograph for a young fan in Germany during the 2018 USO-NFL tour. Cincinnati Bengals defensive end Carlos Dunlap listens during a question-and-answer session with high school football players in Germany. Ben Garland joined fellow NFL players Mario Addison, Mark Ingram, Carlos Dunlap, Latavius Murray and former head coach Rex Ryan on the 2018 USO-NFL tour of military bases in Italy and Germany. From left to right, NFL players Mark Ingram, Carlos Dunlap, Mario Addison and Latavius Murray sign autographs and take photos during the 2018 USO-NFL tour of military bases in Italy and Germany. At Ghedi Air Base in Italy, the group joined U.S. service members for lunch and posed for pictures before trekking to Germany for a series of visits to Sembach Kaserne, Landstuhl Regional Medical Center and U.S. Army Garrison Wiesbaden. Dunlap, a Pro Bowl defensive end with the Cincinnati Bengals, took to his Instagram account to offer his thoughts on his trip. The son of two military veterans said he was honored and humbled by the experience and that he has the utmost respect and admiration for those who serve, especially those stationed overseas. In addition to overseas morale-building visits, the NFL has supported several different USO projects through its Salute to Service campaign, including providing NFL Game Pass to overseas centers, Super Bowl care packages to celebrate the biggest game of the year and flag football kits as part of health and wellness programming. Additionally, NFL donations have helped the USO expand programs and services around the world. Upon arriving in Germany, Garland, an Air Force Academy graduate, said he was honored to connect with service members and their families. “There’s absolutely nowhere else I’d rather be in the world. The opportunity to go around and see all these troops and the smiles we put on their faces, we’re having a blast,“ said Garland, a captain in the Colorado Air National Guard who also celebrated his 30th birthday during the trip. The NFL stars, who debuted the 2018 USO T-shirt, met up with wounded, ill and injured service members and their families at Landstuhl, which is also home the USO Warrior Center, toured a Black Hawk helicopter at Wiesbaden and held a Q&A with local high school football players. Joshua Blake, a high school quarterback who lives on base in Wiesbaden was impressed by how humble and generous the NFL players were.